Every organization is different. Your TeamSupport account has a lot of default settings to give you a turn-key customer support solution. Additionally, you can customize the settings and workflow to meet the unique needs of your organization. 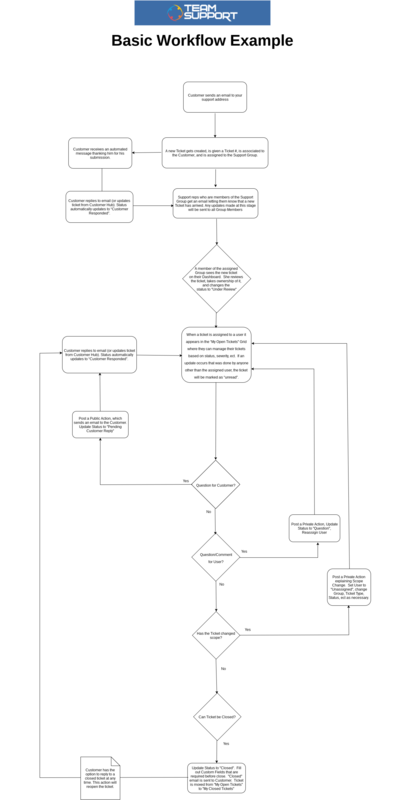 Here is an example of a common workflow for an incident request. This example assumes you have already done the setup outlined in the Getting Started section of this manual. Click here to download a diagram of a basic workflow. Chris with Company XYZ sends an email to support@yourdomain.com. A new ticket gets created, is given a ticket #, is associated to both Chris and Company XYZ, and is assigned to the Support Group. Support reps who are members of the Support Group get an email letting them know that a new ticket has arrived. Chris receives an automated message thanking him for his submission. One of the Support reps who is a member of the Support Group, Kimberly, sees on her Dashboard that there is a new ticket in her group. She takes ownership of the ticket. Kimberly has a question for Chris, so she creates a visible action for Chris, and changes the status of the ticket to “Pending Customer Reply”. That action sends an email to Chris with the question from Kimberly. There is a link in the email to the Customer Hub which Chris follows and posts a new action for the ticket. The response from Chris updates the ticket status to “Customer Replied”. Kimberly receives an email that her ticket has been updated. She also sees this update on one of her Dashboard Reports. Her My Tickets grid also shows that she has a ticket that has an unread action. Chris’s response has indicated that Kimberly has resolved his issue. Kimberly adds another visible action thanking Chris and indicating that she will close the ticket. She changes the status of the ticket to Closed. Chris receives an email indicating that the ticket has been closed. The ticket is automatically moved from Kimberly’s Open ticket tab to the Closed ticket tab within the My Tickets section. These are just examples of a support ticket workflows. There are numerous possible variations to this workflow including the ticket source, ticket routing, action visibility, ticket reassignment, and automated updates through Ticket Automation. Click here to learn more about customizing TeamSupport for your specific workflow.